According to the National Institutes of Health (NIH), about 80 percent of us will suffer from back pain at some point in our lives. Back pain is the second most common reason for a doctor’s visit in the United States and the leading cause of disability worldwide. Americans spend about $86 billion a year to treat our back and neck pain, but lasting relief can be elusive. According to sports medicine and pain management specialist Dr. Sean Wheeler, this is because the conventional approach is missing a major piece of the puzzle. In his is new book, “Uprise: Back Pain Liberation by Tuning Your Body Guitar” Wheeler says working toward strength and stability makes all the difference in recovery and prevention. According to Wheeler, doctors should not only treat the pain, but also the underlying weakness of the patient’s back, otherwise the body can never truly heal. After Wheeler treats his patients’ pain, he has them practice a special type of exercise that targets what he calls the bracing muscles. This isn’t the core, or any other muscle group your trainer knows about, but strong bracing muscles are critical to back stability. Most of us are familiar with our action muscles. These muscles are designed for motion. They flex and stretch, and when we exercise them they grow. Bracing muscles are just the opposite. They aren’t supposed to move. They’re designed to support the weight of our body, and are built for endurance, balance, and to keep the body steady. Just like action muscles, bracing muscles are found all over the body, but they’re much harder to feel. To acquire healthy bracing muscles, the goal isn’t tone but blood supply. According to Wheeler, the better the blood supply, the stronger the bracing muscles and the more stable the back. Years of poor posture and smoking can seriously diminish or even cut off blood supply to the bracing muscles, and once they weaken it can be very difficult to restore their strength. While action muscles show noticeable improvement after a few weeks of training, Dr. Wheeler says patients must work on bracing muscles for at least six months before they can expect to see a difference in their strength and stability. Simply isolating the bracing muscles to exercise them in the first place is a challenge, but a physical therapist can show you how. 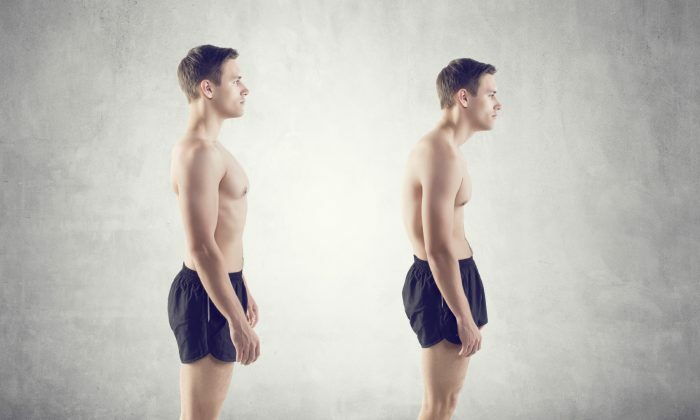 To test your bracing muscle strength, simply stand up straight. When you’re standing with your back in proper alignment—belly slightly tucked in, ears above your shoulders, both feet equally distributing your weight—only your bracing muscles are engaged. You may be able to maintain a few minutes, or even a few hours of good posture, but few adults have the bracing muscle strength to stand up straight all day. When bracing muscles get tired we slouch, or shift weight to one side. That’s when compensating action muscles take over. As this compensation pattern becomes a habit, flexibility diminishes. Action muscles become chronically tense because they’re working overtime at a job they were never designed to do long term. Meanwhile, bracing muscles atrophy because action muscles are doing all the work. Our bodies may get away with this for years, but such patterns leave us increasingly vulnerable to injury. The Epoch Times talked to Dr. Wheeler about why bracing muscle strength and maintaining proper posture is so important to a healthy back. Epoch Times: In your book you tell the story of a football player who comes to see you in preparation for the NFL draft. He thinks your bracing muscle exercises are a waste of time, because he’s used to a more rigorous workout. You convince him to try it for 20 minutes and when you come back into the room he is retching over a garbage can and an eight year old is patting him on the back, saying, “Don’t worry. It gets easier.” What makes exercising the bracing muscles so difficult? Dr. Sean Wheeler: The problem with the bracing muscles is that if they get tired no one goes, “I’ve fatigued the muscles that stabilize me, and I’m no longer able to keep myself steady so I’m going to quit.” No, we just start using other muscles. We just start compensating. It’s difficult to isolate these muscles especially if you don’t know what you’re doing. That’s the real hard part about this. We see people who have had pain for years and years, and we say we have to get these very specific muscles strong. They’ll say, “Well, I’ve done core strengthening.” But it’s not core strengthening. It’s not about how you move. It’s about how you remain motionless. You’ve got your movement down, what you’ve lost is your motionlessness. If at some point in your life your [bracing muscles were strong and steady] and then you lost that through an injury, good luck getting the motionlessness back just through doing activities. If you break an arm and you’re in a cast for six weeks, once you’re out of that cast, that arm is going to get strong again. But you do the same thing with your ankle, shoulder, or your back, you’re not getting there unless someone shows you how to get that motionlessness back. These are endurance muscles so they’re going to fatigue and weaken quicker than you imagine, and it’s going to take a while to get it back. You could have lost it in a week or two, and you have to spend six months trying to get it back. And if nobody shows you, you’re just going to continue to compensate, you’re going to continue to get tighter. Everything is thrown off. Epoch Times: Even if we don’t suffer from back pain, most adults have weak bracing muscles. What is it about our lifestyle that leads to this weakness? Dr. Wheeler: Several things. Sitting is a bad one. We sit too much, and when we stand we don’t stand right. We lean into one leg. We lock our knees. We do all kinds of crazy stuff trying to make up for the fact that we’ve lost some of that glute strength, we’ve lost some of that hip flexor flexibility from all the sitting we do, even as kids. There are many kindergarteners who are flexible, but there are tons of third graders who aren’t. We need some way to evaluate kids all the way through their childhood, because as we get older we get less and less flexible. When you start losing your flexibility, it’s a great sign that you’re compensating for weakness elsewhere. And as a society we have to do a better job of keeping our children on the right path toward not having lifetime injuries. Epoch Times: Reading about the importance of posture in your book made me more mindful of it, at least for a while. The first day I did okay, but a few days later I was slipping back to my old slouch. Why is it so hard to stand up straight? Dr. Wheeler: I had an iPhone app, and everybody hated it. It would go off randomly every 10 to 20 minutes, and when it went off you were supposed to say if you were in correct posture or not. Step one was just sitting up straight. You had to go a week at 80 percent of the day to go on to step two. Most people did horrible for one to two days and after that something clicked and they were good. It took most people about nine days to get through step one. Step two was keeping your belly slightly drawn in. Most people in step two started cheating. Nobody was doing it. Nobody. Getting that belly in and that pelvis rotating under you is hard because it is an enduring muscle. Step three was getting your ears over your shoulders. And not a single person who ever did the app ever made it through step three. Most of the people started cheating at three months of step two because you just get frustrated being told over and over again that you’re no good at it. Epoch Times: You’ve had a lot of clinical success with your method, but how have your colleagues responded to your ideas? Have you seen any resistance or have other doctors embraced it? After that he started following me on LinkedIn, so I think he got it. Epoch Times: Can someone who isn’t suffering from back pain benefit from bracing muscle exercises, and how would they approach it? Would they just see a physical therapist to learn the exercises and emphasize good posture? I don’t think it’s an unreasonable expectation to say, “I’m going to be 80 and I’m going to be very flexible. I’m going to have no arthritis,” because arthritis is just the body’s way of trying to stabilize you. Why can’t your posture be good forever? Why can’t you be flexible and mobile? You can create situations where you don’t get knee or hip arthritis. It really is a decision that comes from understanding the body. I didn’t put a bunch of exercises in the book because I think five years from now the exercises are going to be different. Truly, what I want is for the rest of the medical community to take this on. I hope that five years from now we have a much greater understanding of how to keep everybody healthy for longer. It’s not just about how do we cure back pain, but how we keep everybody in that position where they can stay healthy. But people have to be committed. This isn’t easy. The only people this is going to be easy for are the kids who grow up understanding it. As a physician, we check kids for scoliosis at a certain age. There should be a similar thing for posture. It’s going to be hard, but we’ve done it with other health initiatives. The first thing to do when your low back starts to hurt is relax—both your body and your mind.